RED SPAROWES return to Robotic Empire with another amazing record, this time being joined by GREGOR SAMSA for this split CD release. 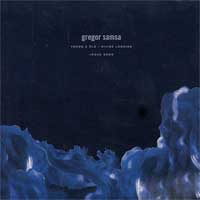 Richmond, VA's GREGOR SAMSA shine bright here with two tracks of serene and dark ambient/rock music. Haunting and beautifully sung male and female vocals intertwine with atmospheric guitars, keys and string arrangements. One of their two tracks is a preview for their 55:12 full-length album, and the other is exclusive to this release. Los Angeles, CA's RED SPAROWES deliver two phenomenal tracks of their moving and intense instrumental creations. One exclusive new track is joined by a phenomenal demo version of a song found on their "At The Soundless Dawn" debut... and with members of ISIS and NEUROSIS behind this ship, RED SPAROWES continue to steer into amazing directions. In fact, both bands harken back to the glory days of shoegazing's past without compromising their modern spin on powerful and innovative independent music.